The Black Forest, Basel, and all that Jazz……. Crossed Wires – and Surviving the Consequences. The Oldest Station Building in the World? The Zentralbahn Saves the Day. 100 Years Chur – Arosa. 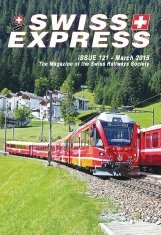 Düwags on Basel Line 21. Watch Out for the Gradient. Swiss Post – Yellow in Motion. Back in the Baggage Car. 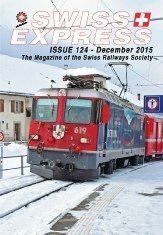 Genève Rail Projects –CEVA Update. 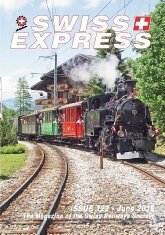 125 Years of the Berner Oberland-Bahn. ‘Neuchâtel‘ – A superbly restored paddle-steamer. 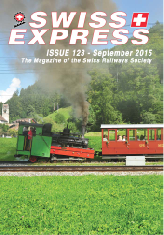 Steamboat Jubilees in Switzerland 2015. Swiss invest in new equipment..
Closed stations of the Bözberg line. The Brunnen Cement Works Railway. Lötschberg Base Tunnel to be Completed. Graubünden – A Winter’s Tale. Something not up to the usual standard!